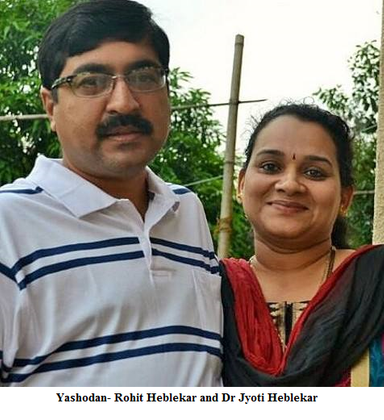 Yashodan Heblekar and his wife Dr Jyoti Heblekar are unusual in their repudiation of the fast paced city life that most associate with money and ease. Jyoti is a practicing Homeopath and Yashodan an insurance salesman with an engineering and an MBA degree. Eccentric and innovative in their approach to life, the husband and wife team, along with their son and daughter, Tanmaye and Shrusti, who are also the resident butterfly experts, have created a butterfly conservatory around their house called Mystic Woods. The flight from the city prompted the couple to build a house in Pisgal, Ponda (Goa), which is unique in its construction in that it supports a garden on its roof and is built on huge rainwater harvesting tanks. The roof garden has come under fire for its apparent infeasibility. Prophets of gloom and doom have predicted roots growing through the roof, leakage and erosion of soil in the monsoon season. Fortunately, science and a bit of luck have rescued the house from any such calamities. For the last fifteen years, there has been no protrusion of roots from the eight inch deep roof garden. The coolness sustained by the wet soil has prevented the rooftop slab from expanding, while allowing the temperature within the house to remain constant no matter the season. The rooftop has no columns and struts and is a load bearing structure by itself. It has a slight incline, which prevents rainwater from soaking in completely, and loss of soil is stopped by the ridges built to hold it back. The Heblekars now had a constant supply of water, ample garden space and respite from nosy neighbours, but their peace was threatened as trouble reared its head in the form of trees being cut down on the hill opposite their house. The builder was unable to sell the plot and had decided to give it to a group of a hundred people who wanted to set up slums in the area. ‘We had moved from the city to the village for a bit of greenery and we found that going too. So for purely selfish reasons we bought the land from the builder,’ says Yashodan, who together with a friend and some of the residents purchased 4000 square metres of settlement area there. The Heblekars tried growing trees and vegetation on the land, which had nothing but caju trees on it, however, lack of a natural water source and termites were major obstacles. ‘Why did we choose butterflies? Because butterflies are excellent botanists!’ says Yashodan. Each butterfly has certain plants such as abolim (firecracker flower), haldi kumkum (lantana), etc on which it will lay eggs and on which it feeds. These plants need to be endemic and the reason that we see fewer butterflies these days is because we have introduced foreign plants into our gardens. The Heblekars began collecting endemic plants, some of which had almost disappeared. Another element necessary to promote the butterfly populace was keeping the air clear of pollution which can diminish the butterflies’ mating visiting card ‘pheromones’. The process of mating is not simple, with the males having to offer the females balls of wet soil that contain salts and minerals that aid the development of the eggs. For this the soil needs to be free of pesticides and fertilisers. Out of twenty caterpillars that emerge from these eggs, at least eighteen will fall prey to lizards, birds, wasps, hornets, etc. ‘The entire jigsaw puzzle of setting up a beautiful forest starts with something as simple as butterflies,’ says Yashodan, referring to all the endemic plants that were eventually brought in. The butterfly conservatory provided the Heblekars with the opportunity to use all three water tanks as they created an artificial stream that flows down the slope. They now have an aviary showcasing exotic birds, and a bistro, in addition to the conservatory. Yashodan stresses that the starting point of all of this was rainwater harvesting; water that is now used for their own consumption helps the vegetation of the butterfly conservatory thrive and neighbouring areas benefit from it too when there is a water shortage. Yashodan jokes about the fact that while the family has their drinking water filtered, their gardener happily consumes it as it is with no negative repercussions. The termites were a mighty challenge that would not abate in the first two years despite using solutions of cow dung and neem, and other remedial recipes suggested by friends. The termites persisted till ants, called humleh in Konkani, appeared on the scene. Since then the two seem to balance each other out without harming the surrounding forest area. There are other factors beyond their comprehension that have also helped. Yashodan says, ‘The lesson learnt is not to do anything. Nature has a way of sorting out itself in a much better way than we can ever plan’. It was a risk filled investment that the Heblekars made and four years ago the conservatory was burnt down by neighbours who thought it would devalue the real estate. Undeterred, the Heblekars began all over again. The conservatory boasts of visitations and the breeding of the Southern Birdwing, the largest butterfly found in India. This butterfly is one of several species besides the Blue Mormon and Common Mormon that feed on lemon trees. The best time to experience this natural paradise is between the months of October and February. There are interesting insects (robber fly) and plants (fantastic flytrap) that can be viewed too. The Heblekars have been deemed crazy by their neighbours but the not-for-profit conservatory has managed to attract neighbourhood kids, who come when they have assignments related to nature. Yashodan and Jyoti are happy as long as the love of nature and sense of responsibility towards its preservation can be instilled in these young ones; at least part of their mission, which is to save the Western Ghats’ biosphere, will be fulfilled in a fruitful manner. 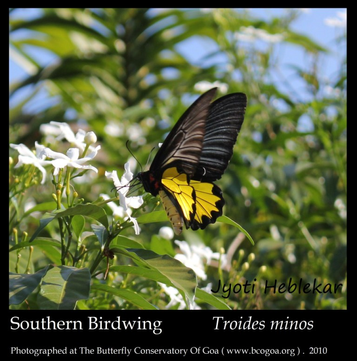 Source of information: Yashodan Heblekar’s lecture on the Butterfly Conservatory of Goa at Kokum Design Centre, Porvorim.